Above is the Neosid 28-053-31 ferrite toroid in an implementation of my HF Balun Project using XLPE wire for the winding. 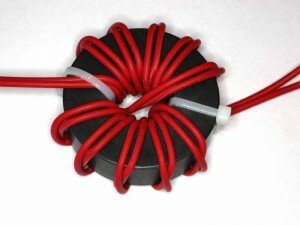 The core is a NiZn ferrite toroid of 63x26x19mm (larger than FT240 size). The method was to heat a bare core in an oven for several hours to allow it to fully ‘soak’ to the temperature of the oven. The heated core was then suspended vertically in still air by a piece of cotton and its temperature recorded over almost an hour. 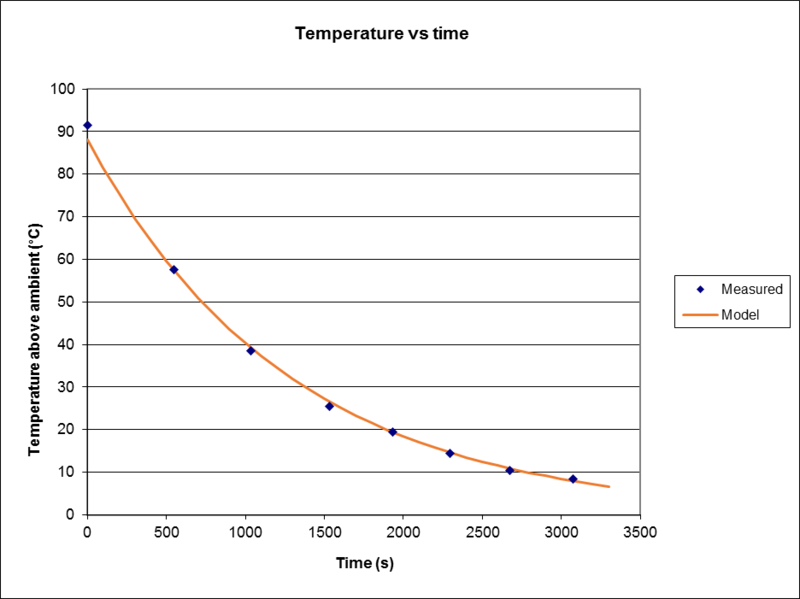 Above is the measured temperature difference (ie core temperature above ambient) and the log of measured temperature difference. We can expect that the temperature difference will decay roughly according to a model T=a*exp(-t/τ) where a and τ are to be discovered by fitting a straight line to ln(Tdiff). τ is the time constant for the system, and is the product of thermal resistance Rth and heat capacity C (Cp*mass). The model was a very good fit with an F statistic of 3076 with 6 df. Above is a plot of the measured data and the derived model. 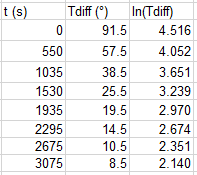 From the derived model T=88.1*exp(-t/1280), and knowing the heat capacity of ferrite (Cp=1000J/kg/°) and mass of the core (0.213kg), we can calculate the thermal resistance to air of the core suspended vertically in still air to be 6.01°/W. Note the implication of the time constant of 1280s, these cores are very slow to heat or cool to near their final temperature. If they are observed to heat up quickly from ambient, they are on their way to an extreme temperature. If we assume maximum insulation temperature is 200° and maximum ambient temperature is 40°, we can allow a maximum temperature rise of 160° which implies maximum power dissipation from the bare core of P=160/6.01=26.6W. In practice, a winding on the core probably increases thermal resistance, and packaging the whole balun in an enclosure would further increase thermal resistance. In a practical application, this core might not be good for much more than 10W average dissipation. The method assumes uniform heating through the core cross section. The test achieved that, and it is a reasonable assumption for RF heating of cores below the µ’ knee. 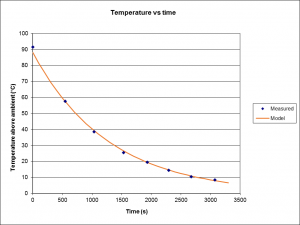 The derived thermal resistance is probably a good estimate for all µ’. The calculated value of Rth is a little lower than that given by the Rule of Thumb for PCB surfaces of 10W/m^2/K for 0.0105m^2 which gives Rth=9.5°/W, perhaps partly due to the orientation and emissivity of the ferrite surface. Note that some core materials will be limited by Curie temperature rather than insulation temperature. Curie point for the subject core is 270°. Interpolating these results to the common FT240-43 which should not operate above 130° which is 90° above the example 40° ambient, and with three quarters the surface area might have Rth around 8°/W, maximum dissipation of a bare core in free are might be around 90/8=11W, considerably less with winding and enclosure.